This project was a first for me in more ways than I can think of. Virtually every aspect of the project was something I have never done before. Needless to say, with no mentor other than the internet, it was definitely a challenge! One of the doors is a little crooked because it turned out that one of the cabinet side panels was bowed out, but only on the top front corner. Not a fun thing to work around. It didn’t help that I put one of the hinges a little closer to the edge of the door than the other, either. I ended up trimming one edge intentionally crooked and fiddling with the hinge adjustment a little. It’s good enough for what it’s for, but it certainly wouldn’t pass for decent interior cabinetry! Oh, and one of the door handles is WAY off. That’s what I get for ignoring the voice inside that was screaming at me, “Stop! It’s going to be crooked!” And rushing. Rushing is bad. Unless you’re a running back. Then it’s expected. The work surface is a double layer of 3/4” MDF. I still intend to trim the edges down a little, but I haven’t yet settled on exactly how much overhang to leave. Right now there is an extra four inches on three sides, and eight on the left in case I decide to buy a vice. The face frame, which I had originally intended to paint, is birch. I found out the hard way that 18 gauge brad nails secured into plywood edges will not hold a face frame without help if there are doors attached to said frame!!! Another small “design change”. :-) Let’s not get into the other “design change”, which proved to me that glue joints are, in fact, stronger than the wood itself. Okay, plywood in this case, but you get the picture. It wasn’t pretty, but at least I didn’t have to scrap everything and start over. The entire cabinet rolls around on non-locking casters. If I need more stability I will jam some rubber doorstops under the edges. If that doesn’t work I will prop it up on 2×4’s. If that doesn’t work I will bury it in sand. Down the road I hope to implement several enhancements inspired by Cory, but that’s a project for another day. All in all this was a fantastic learning experience. I think I paid through the nose for some things, especially the sheet goods ($55 for a sheet of MDF; $45 for 3/4 inch “shop” plywood, whatever that means), but the hardware (swivel casters, rails, hinges, and handles) only came out to around $50. All told it end up being around $200. I suspect it could be done a lot cheaper with different wood suppliers. The word “simple” is rarely as it appears? I also found out the hard way not to pull both shelves all the way out at the same time if they are loaded with nearly every power tool you have. I panicked a bit when the back wheels came off the ground!!! A mentor once told me it’s not that you can make it perfect it’s that you can make look that way! The great thing about working working is you are always learning. And I think you did great for a first project. Don’t worry, my wife always say’s ” the world’s most expensive diamond has flaws ”. At least it makes “me” feel better. Keep up, never give up. Welcome aboard!! Looks like you got it finished and in good servicable condition!! Nice work and it looks great! Shop projects are ideal for making mistakes and learning. I’m flattered that I could have inspired a project. i think you’ll find that this kind of stuff is a continual evolution. I’ve got quite a few changes that I need to make to mine little shop cart now that I’ve been using it for a while. You’re never really finished with this kind of thing. Welcome to Lumberjocks. Looking forward to seeing what else you come up with. You did good. I agree with Cory, shop projects can really help improve your ww skills. Keep it up. Great job. You may think that you didn’t do a good job but, you inspired me to make a few changes to some cabinets I am making for my shop. With no mentor, you mentored me. Thanks for the ideas and keep up the good work. Keep posting pics of the projects and lets see your shop. Heh, my “shop”... Right now that consists of about a six foot by six foot open space on the concrete floor of my garage, and a small table full of junk along a nearby wall. It’s a little bigger when my car is outside, but only temporarily. This cabinet/cart/bench is going to be pulling a lot more than double duty for a while! I just realized I didn’t include pictures of the sides and back. It’s all the same green color as the doors. Can’t go wrong with $3 paint from the mistint shelf! Cory, some of your projects show organizational brilliance as far as I’m concerned. If I borrow your pegboard, clamp rack, and side shelf ideas I should be able to store the vast majority of my stuff all on one highly versatile cart. Looking forward to it. Thanks for the kind words, everybody! If nothing else at least I recognize most of my mistakes. Let’s just hope I learn from them next time around. I think it looks great. It will look even better after it gets beat around a little in your shop and you actually start not caring about the looks and start admiring how practical it is. I always try to make my shop stuff look as good as something I make for the house of for a gift but the important thing is how well it works and how well it holds up. I have found when working with European hardware, that you make a working model of what you plan on making so you find out just exactly how much clearance you have. 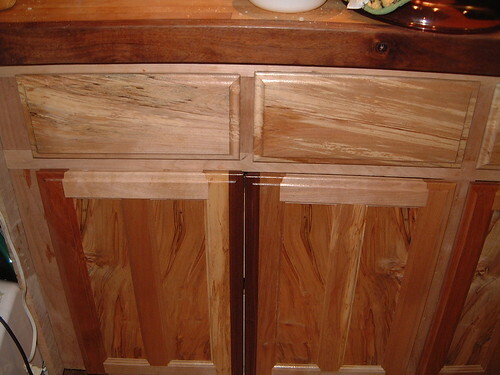 See the walnut strip in the middle of the doors. That was not a design that was a modification to fix the too large gap between the two door. That’s a big gap!! What is the deal with that hardware Karson? When i ws about 14 or 15, my uncle had me making boards to close some grain bin doors. They were about 10 or 12” wide by 3’ +/- long. He showed me how to cut them and I proceeded to make a few. didn’t take long for me to out smart the project. I made several since they were all the same ;-)) When I put them in the door wasn’t parallel!! :-(( TOO SHORT!! :-(( Fortunately, I was able to use them else where in other doors ;-)) i went back to making them one at a time.